Well, ladies and gentlemen, the first episode of the Schmookler & Huffman program aired on 550 AM WSVA this morning. During our hour on the air, we discussed the NSA and the sometimes conflicting ideals of liberty and security, some of the scandals that continue to tarnish the reputation of Virginia Governor Bob McDonnell, and a bit of an exploration into political principles and philosophy. I’m pleased to say that our discussion seemed to be well received and, as a result, our second show is slated for an upcoming Monday in August. I’ll provide these details to you as soon as they become available. However, if you were unable to listen to our program live this morning, don’t fret as you can hear it at this WSVA link. This afternoon and evening, Uncle Glover’s County Store hosted a summer festival in Sherwill, VA, a small community located just outside of Concord in Campbell County. As is typical with these sorts of gatherings, the event attracted political activists, office seekers, and the children of office seekers. The Libertarian Party was the most active at this event; not only did they have a booth with literature and yard signs, they also had two candidates, Robert Sarvis for governor and Jonathan Parrish for the 23rd House of Delegates district. 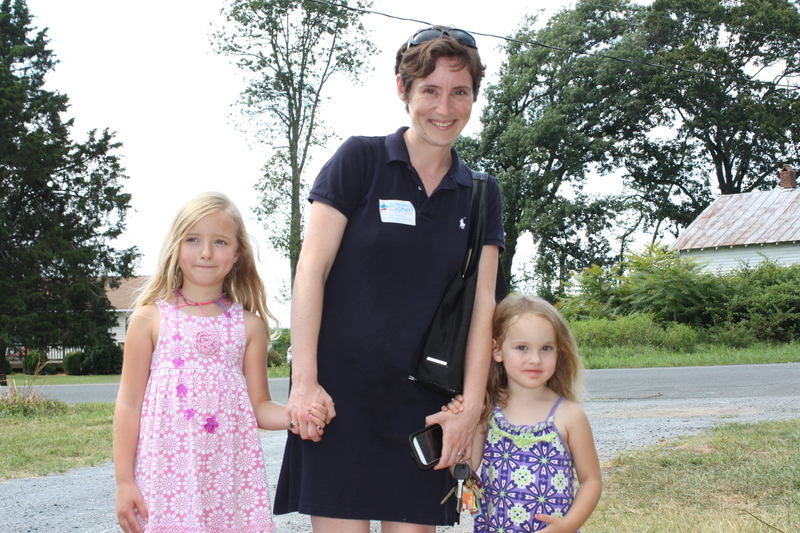 The Democrats featured Katie Webb Cyphert, who is running for delegate in the adjoining 22nd district. The Republican Party was not visibly in attendance nor did any of their incumbent delegates or other hopefuls participate in this event. 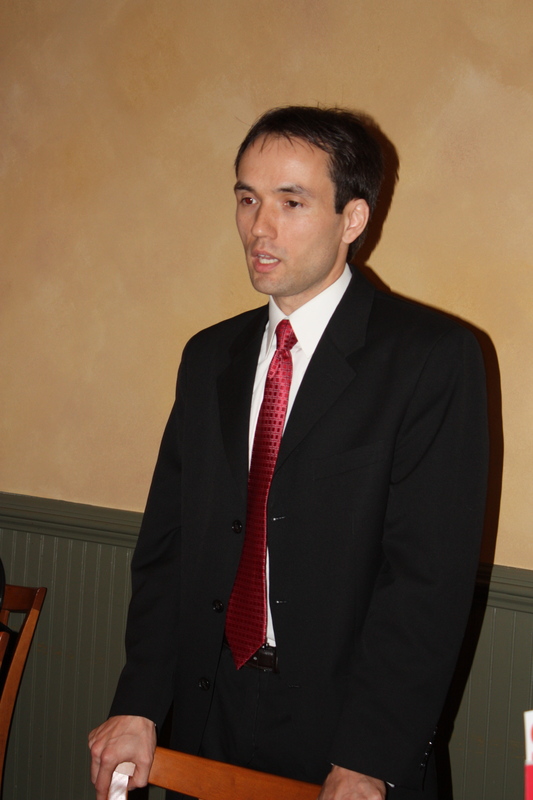 Earlier this week, Robert Sarvis, the Libertarian candidate for governor, spoke to a group of about twenty to twenty-five activists in Fredericksburg, Virginia. 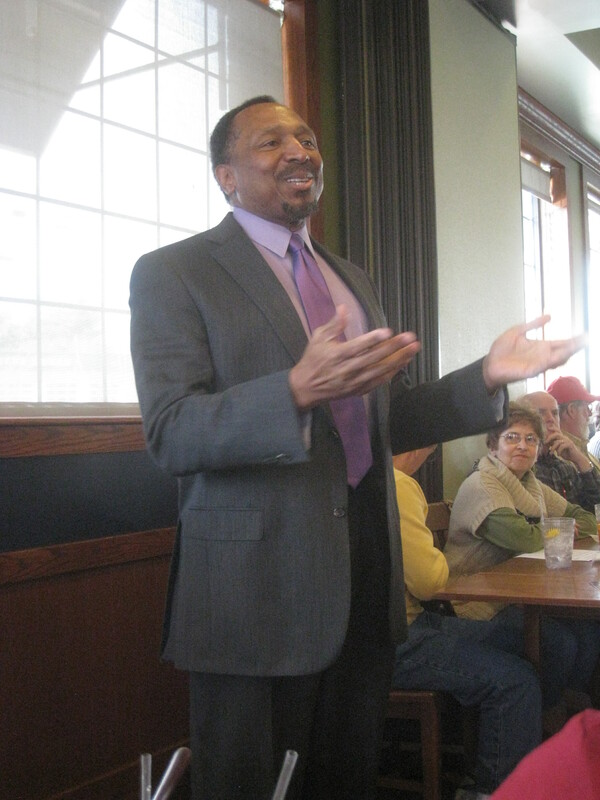 Although first mentioned on the Virginia Conservative after the state Libertarian convention in April, the speech Mr. Sarvis gave in Fredericksburg provided a good introduction to his candidacy, his political philosophy, his concerns with both the Republican and Democratic candidates, and a variety of other topics. Although I recorded his entire discourse, including the question and answer period that followed, an unforeseen technical glitch caused a vast majority of the tape to be lost. Nevertheless, his introduction, which is still quite interesting, did survive and so I’m pleased to present this segment to you. I hope it proves useful as you learn more about the various candidates running in the 2013 elections. 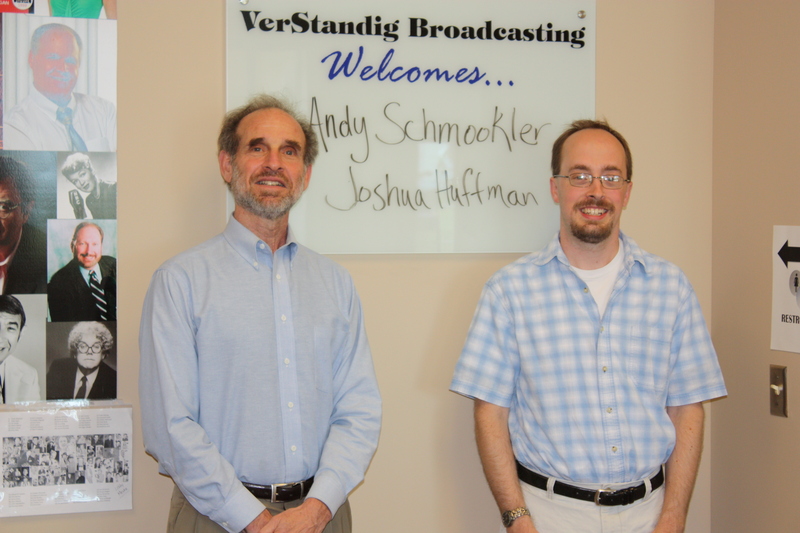 Andy Schmookler & Joshua Huffman. 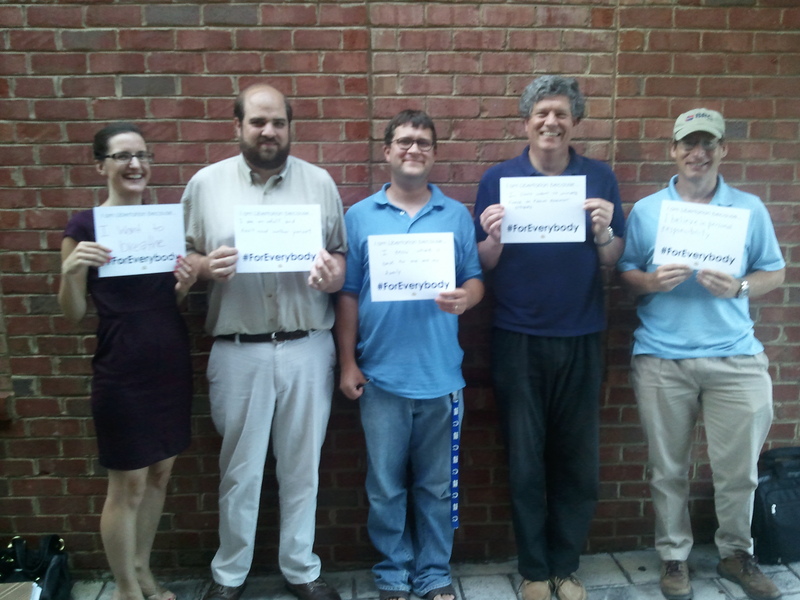 Photo of Andy Schmookler from nonesoblind.org. What happens when you take a progressive author, commentator, and 2012 Democratic congressional candidate with a penchant for biblical quotations and combine him with a paleoconservative/libertarian political activist and blogger who was formerly employed by both Dr. Ron Paul and the Republican Party of Virginia? Next week, the answer to this question will be revealed. 10 AM, Monday, July 29th, on WSVA 550 AM, will mark the start of this new radio show. Andy Schmookler, the aforementioned author, and Joshua Huffman, the author of The Virginia Conservative, will sit down and discuss some of the more pressing political issues of the day. Presumably, it will bear some semblance to Fox’s Hannity & Colmes Program (though hopefully without the stain of extreme rudeness which was common on that show). Whether you consider yourself a liberal, conservative, libertarian, statist, or something else, you ought to tune in to Monday’s program. 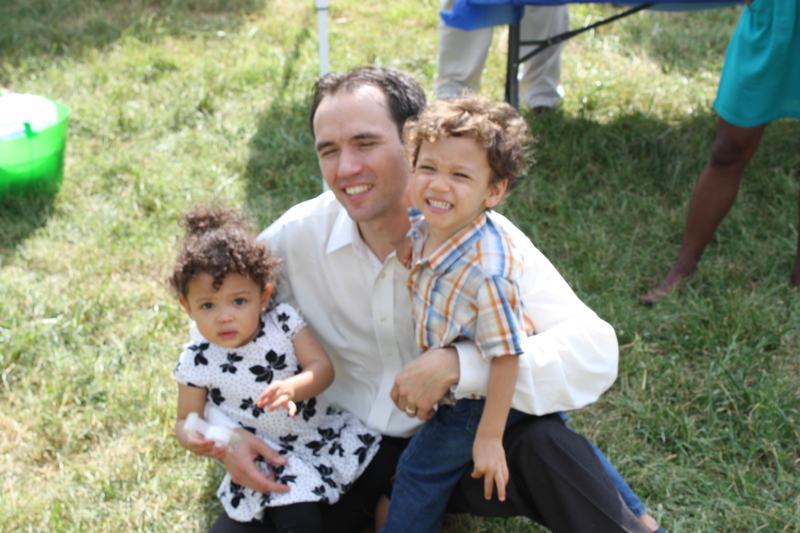 It is time to expand political dialogue in the Shenandoah Valley! On Monday evening, a handful of liberty-minded political activists gathered at a coffee shop in Lynchburg, Virginia, for two purposes. The first was for the reestablishment of the Libertarian Party in the region. Although politically influential a decade or so ago, the local Libertarian effort has diminished considerably in recent years. This newly refounded group seeks to bring together Libertarians, not only in the city of Lynchburg, but also the surrounding counties of Campbell, Bedford, and Amherst, and even the nearby county of Appomattox. In addition, yesterday’s meeting gave these Libertarians a chance to speak with Jonathan Parrish, the Libertarian candidate for the 23rd district seat in the Virginia House of Delegates. 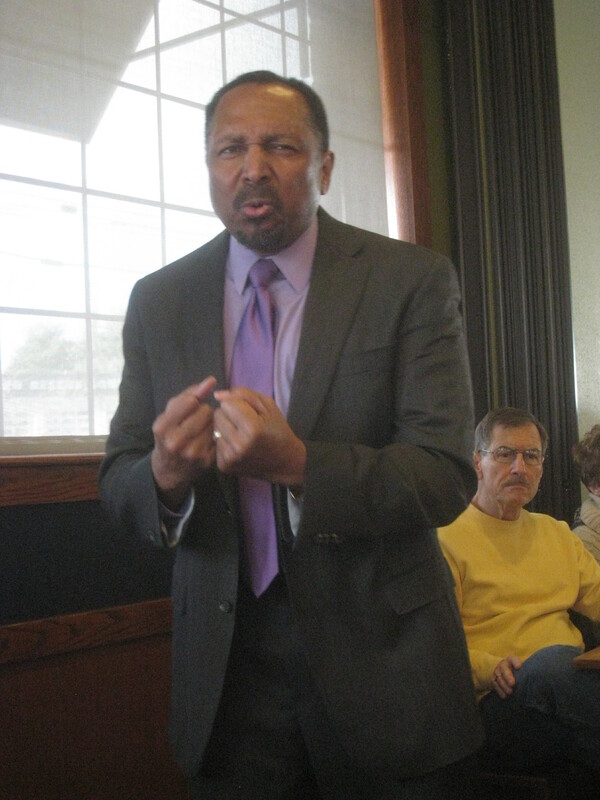 Mr. Parrish is challenging T. Scott Garrett, a Republican first elected in the 2009 cycle. According to his campaign website, Parrish’s three priorities in this race are: cutting taxes and spending, fighting for the legalization of marijuana, and reforming the school system. 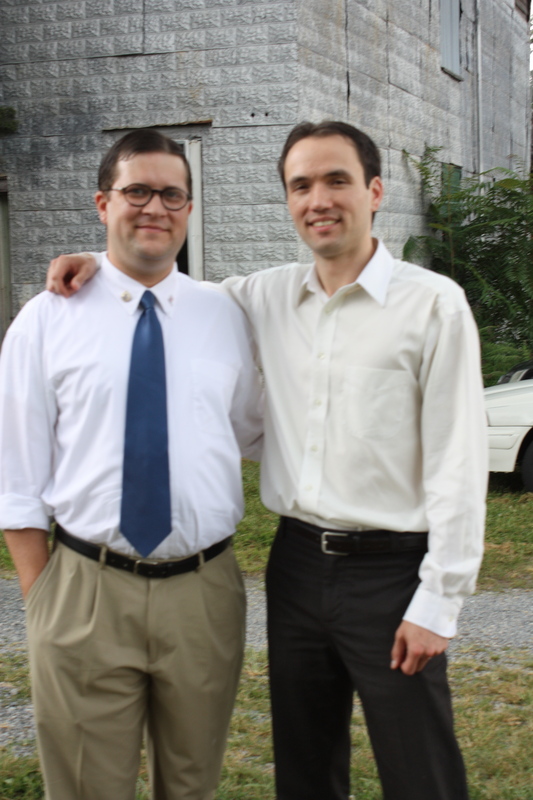 There is little doubt that the Virginia Libertarian Party is expanding their efforts; besides the Libertarian affiliate in Lynchburg, another group is taking shape a hundred miles away in Harrisonburg, and there are likely more yet unreported. In addition, they are running a considerable number of candidates this November. Including Robert Sarvis, the second ever Libertarian candidate for governor, and Jonathan Parrish in the 23rd, the party is contesting a total of six seats in the House of Delegates. More information about the Lynchburg Libertarians, including dates of further gatherings, can be found on Facebook or meetup.com. If a fellow political activist were to tell me on the morning of the Virginia Republican convention that E. W. Jackson would be the Republican nominee for lieutenant governor, I would have been highly skeptical. Not only did he finish with a rather dismal 4.72% in his last election, the 2012 Senate Republican primary, but also his campaign had fallen significantly behind in fundraising totals when compared to most of his six rivals. And, as a result, his staff suffered an important loss. Originally, I had predicted that Mr. Jackson would not pass the first ballot at the convention. However, after seeing a considerable swell in grassroots support in the days leading up to the convention, I didn’t think it too unreasonable for him to survive into the second round. He was successful in capturing the hearts and minds of a significant number of my fellow delegates, especially those from Harrisonburg and Rockingham County. However, Jackson not only led on the first ballot, but also led in each successive ballot until he won the nomination. He performed exceedingly well among religious conservatives, who turned out to Richmond in surprisingly large numbers. Many Republicans, myself included, quickly dismissed the idea of a Jackson victory in November. After the results for the third ballot were announced at the convention, where Jackson’s nomination was all but a certainty, I leaned over to a fellow delegate and remarked that the GOP had conceded the lieutenant governor race. Now why would anyone make this claim? Well, beside last year’s electoral drumming and continued fundraising difficulties, Bishop Jackson has a history of untempered speech. Over the years, E.W. Jackson has made a considerable number of controversial statements, ones that I certainly wouldn’t make if running for public office, and many that I think are needlessly inflammatory and/or happen to disagree. It is profoundly difficult for such a galvanizing lightning rod, like Jackson, to win the independent vote. So is the Jackson campaign quixotic? It’s easy to think so, as many in the establishment seem to have written him off as politically dead. However, I have noticed an unusual spark as of late. Many of these same delegates who attended the convention are donating significant time and money to assist the Jackson campaign. Given that both his funding and name identification are lower than they ought to be, across the state his volunteers, in conjunction with the campaign, are organizing gatherings and fundraisers at homes, businesses, and at universities (as is the case in Harrisonburg). Although supporting the entire ticket, they walk their neighborhoods to primarily promote this unique candidate called E.W. Jackson. They seem to comprehend an important concept, that electoral victory is not achieved simply by being correct in one’s principles, but through continued hard work and dedication. Truly, any campaign would be blessed to have such a dedicated core of support. Whether you are an E.W. Jackson fan or not, it is undeniable that he faces a tremendous uphill battle in the upcoming months. Yes, the smart money says that the Democratic nominee, Ralph Northam, will win in a landslide. Nevertheless, the Jackson supporters are motivated, organized, and, most importantly, active. Can they pull off a November upset? At this point, it is unlikely…but not impossible. 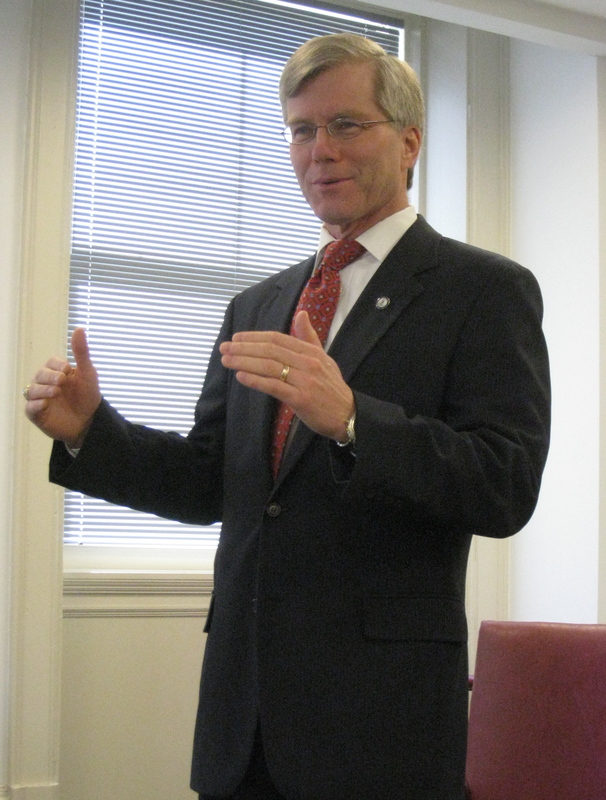 Lately, Virginia politics has shifted to an ethics probe surrounding Governor Bob McDonnell. Yesterday, Bearing Drift, the largest conservative blog in the state, reported that the governor would resign, a rumor denied by the governor’s staff. To recap for those who haven’t been following this story, Bob McDonnell has recently come under fire as a result of an FBI investigation which discovered that one of his donors has given the governor and his family thousands of dollars in unreported gifts including paying a substantial sum for the wedding of the governor’s daughter and giving the executive a multi-thousand dollar Rolex watch. State Senator Chap Peterson is the first (and so far only) legislator calling upon the governor to resign. But what does Governor McDonnell think about possible ethics violations? Well, if we rewind the clock four years, we come across the case of Phil Hamilton, a former member of the House of Delegates who lost his seat in a scandal involving Old Dominion University. Almost as soon as the allegations were made, before any charges were filed, McDonnell, along with Virginia Lieutenant Governor Bill Bolling and Virginia Republican Party Chairman Pat Mullins, called for Hamilton to resign. He stated, “From what I have seen of published news accounts containing emails and admissions, it appears that Delegate Hamilton has violated the public trust. Based on this public information it would be in the best interests of his constituents for him to step down…” McDonnell went on to add “…but if he believes that the due process of a full inquiry by the House Ethics Advisory Panel will clear his name, he should have a full opportunity to present his case.” McDonnell, like his cohorts, were quick to condemn Hamilton without either a trial or full ethics inquiry, choosing instead a course which he thought would best help the party and his own chances during his 2009 run for governor. Then State Senator Ken Cuccinelli stood alone in his conviction that Hamilton, like anyone accused of a crime, ought to have his day in court before being thrown under the bus by his party and his running mates. So, will Bob McDonnell resign based upon these charges? Well, if he wished to remain morally consistent he would do so. After all, if the mere charges of bribery and corruption were enough to bring down a delegate in 2009, surely this line of thinking would be constant for a governor in 2013 as well. Unfortunately, especially in politics, far too many politicians live in a world where they insist on a certain moral code…as long as it applies to everyone but the person advocating the code. Is Bearing Drift’s prediction of a resignation in the works? I suppose the answer to this question hinges upon the severity of the charges and the evidence against McDonnell. Either way, I expect we will find out in the coming days. 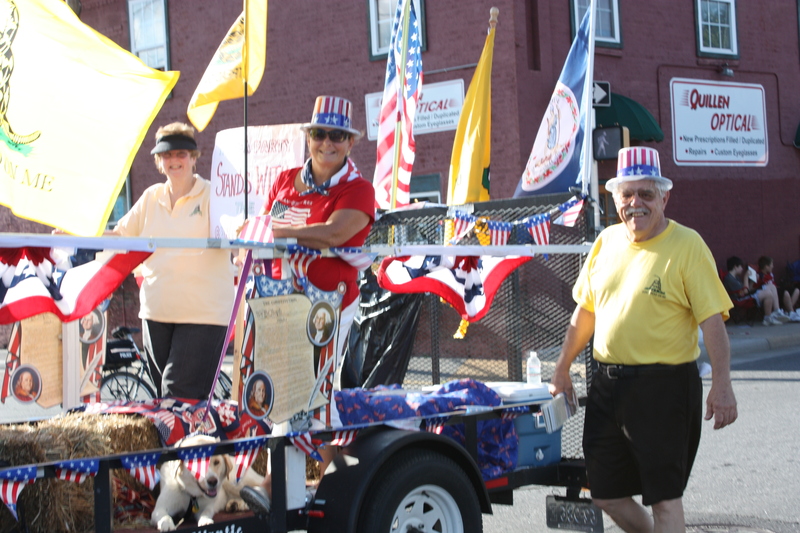 As with communities throughout America, yesterday the citizens of Harrisonburg celebrated the 4th of July. The city’s downtown area was filled with an assortment of vendors and entertainment, not to mention politicians and political activists. Unlike the previous year, the local Democratic Parties did not seem participate in Thursday’s festivities, somewhat surprising given the three statewide races going on this fall. 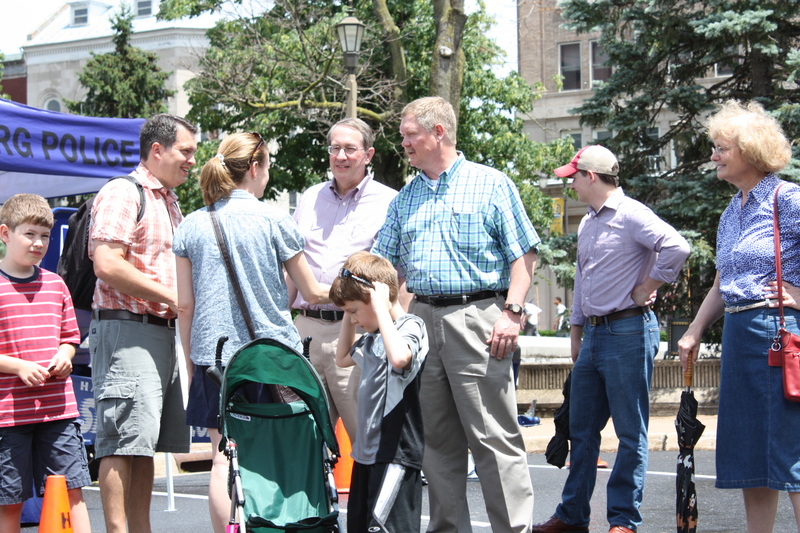 Representative Bob Goodlatte (VA-6) and Delegate Tony Wilt of Broadway greet the crowds. 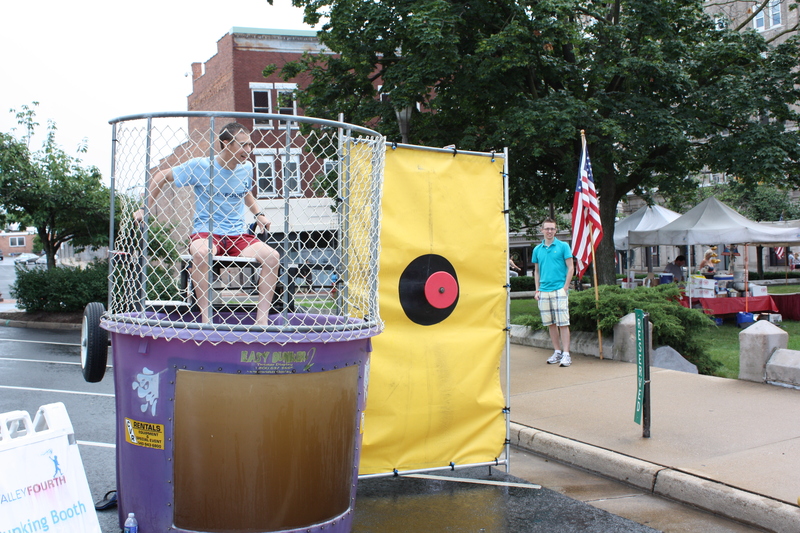 During the early afternoon, Council Member Abe Shearer manned the dunk tank for charity. 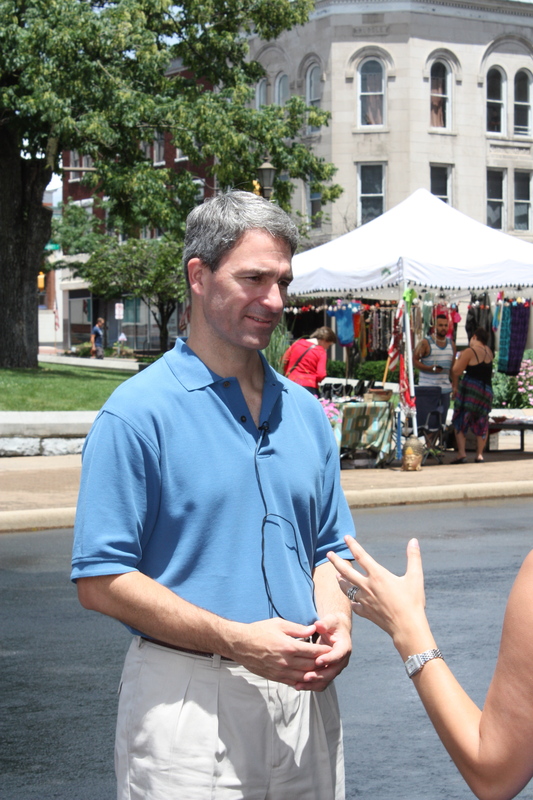 Attorney General Ken Cuccinelli speaks to the media. 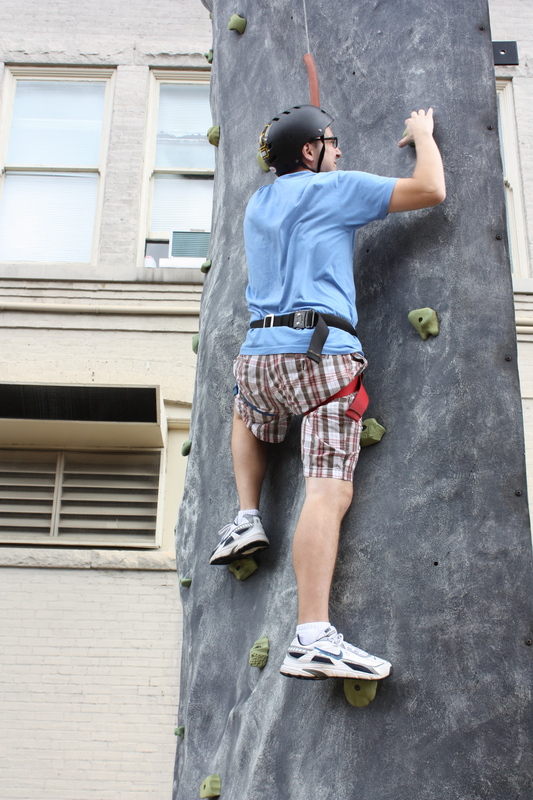 VA Republican Liberty Caucus member Steven Latimer climbs the rock wall. 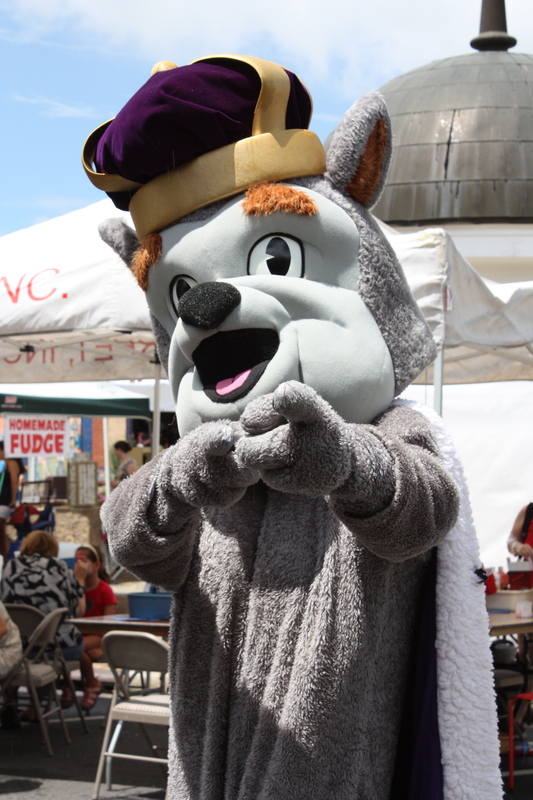 JMU’s Duke Dog shows his spirit. 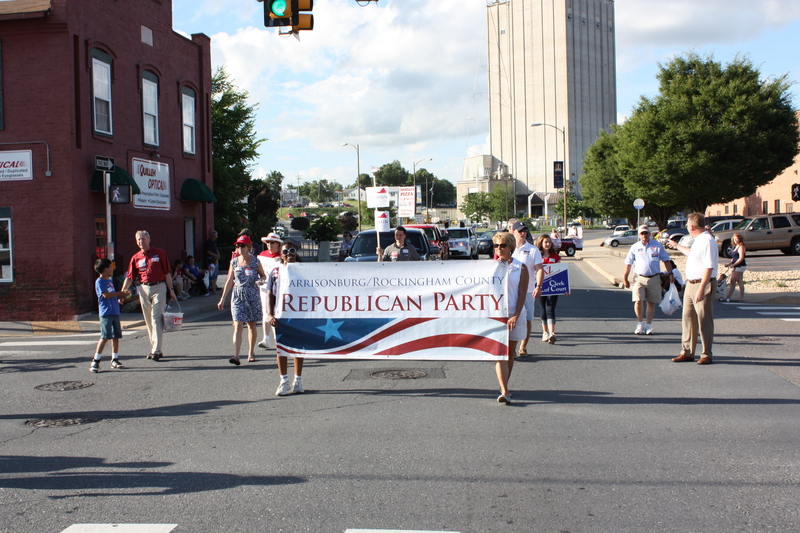 The Republican Procession featuring Delegate Steve Landes of Verona on the far left and Harrisonburg/Rockingham Clerk of Court Chaz Evans-Haywood on the far right. 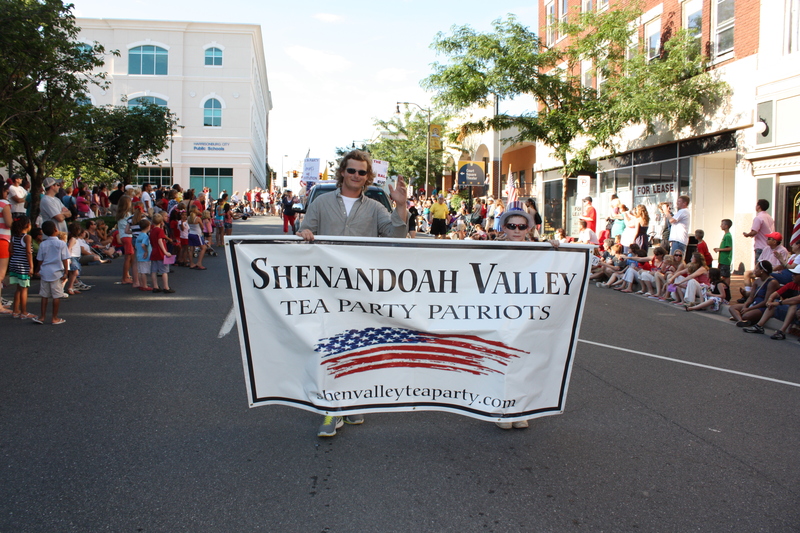 The banner of the Shenandoah Valley Tea Party. Tea Party Director Donna Moser, Treasurer Nancy Stone, and Co-Director Tommy Moser. 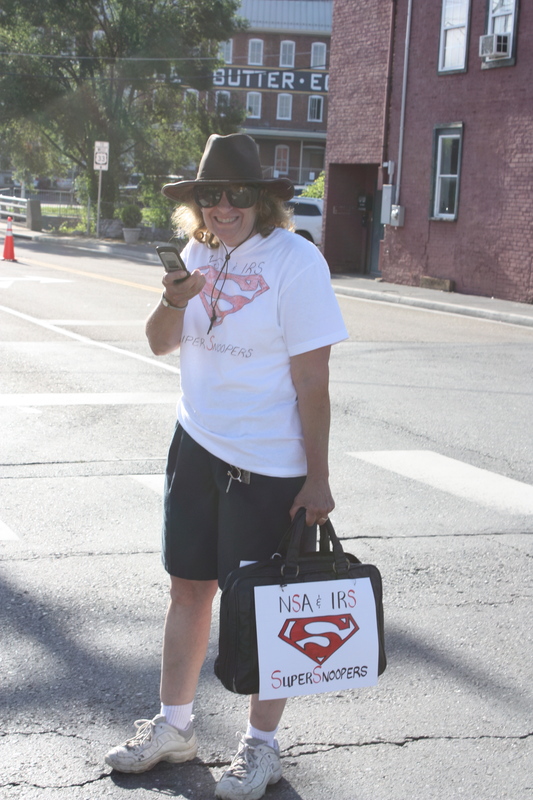 Tea Party Secretary Lois Paul playing the snooping NSA/IRS agent.